We have a beautiful rhubarb plant in our garden and every year I get excited when I see the first leaves sprouting. At that time I am thinking of the recipes that I should try with the newly growing rhubarb, but it usually ends up that I really don’t use much of the rhubarb at all. This year I think that I have done a little better than most years. I have tried a few new recipes; most of them have turned out quiet delicious. My sister told me about the rhubarb crisp she had made earlier in the spring and that got me thinking about making a crisp with the rhubarb from my garden . Last week I finally got around to making it, but I decided to add a couple more fruits with it. I had made it when my father-in-law was here and he had mentioned that he didn’t like desserts that were tart, so that is why I decided to add a couple of sweeter fruits. This is a simple crisp that is easy to make, you can add more or less sugar according to what you like. If you don’t like the fruits that I have paired with the rhubarb you can always try your own combination or maybe you would like the rhubarb by itself. Butter a 9-inch pie pan and set aside. Preheat oven to 350 degree F.
Peel the rhubarb and cut in chunks and slice the strawberries. 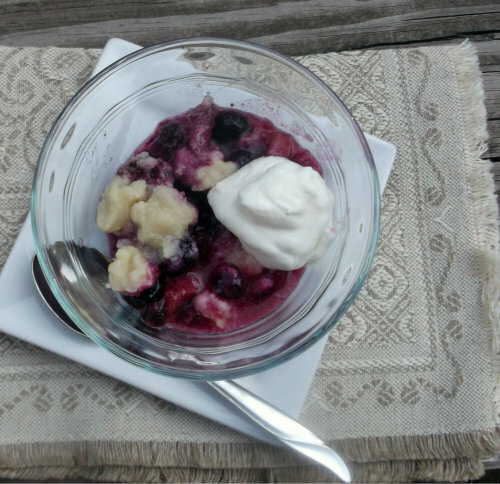 Combine the rhubarb, strawberries, and blueberries in a medium bowl add sugar and cornstarch and mix until all is combined. Place the berry combination in the butter pie and place in the oven. Bake for 25 to 30 minutes the mixture should be bubbling. While the berries are in the oven combine the butter, sugar, and flour and mix until all combined. 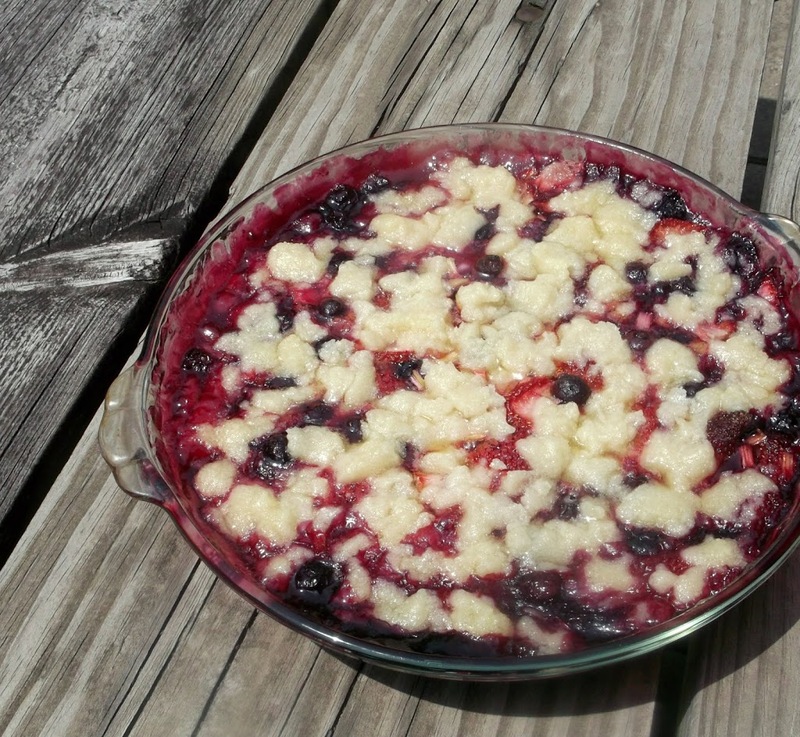 After the berries have baked the first 25 to 30 minutes take out and crumble the topping over top of the berry mixture. Place back into the oven and continue to bake about 10 minutes until the crumb topping is lightly browned. I don’t mind a tart dessert, but I do think I’d like this with the sweeter fruits added in. And it looks so beautiful. I can still get some rhubarb, so I am ready to use this recipe. 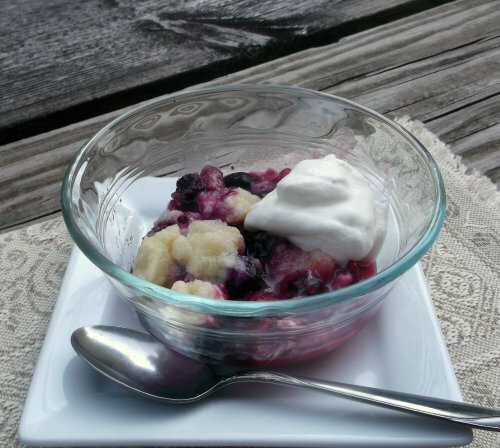 We’ve been eating tons of berries and fruit lately. Love the combo of flavors you have in this crisp – really nice. We haven’t made a crisp recently, and you’ve reminded me we need to! Thanks so much.